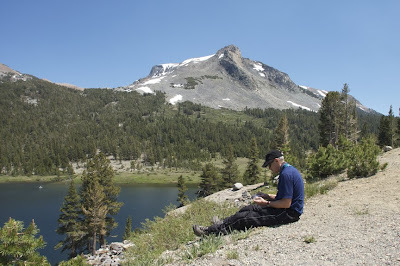 What I did during my summer vacation. 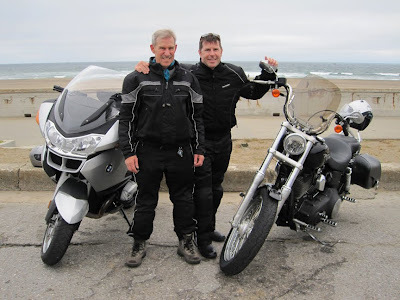 Here is a quick recap of my coast-to-coast motorcycle trip with my brother Don. We traveled from the Pacific to the Atlantic in just over two weeks. 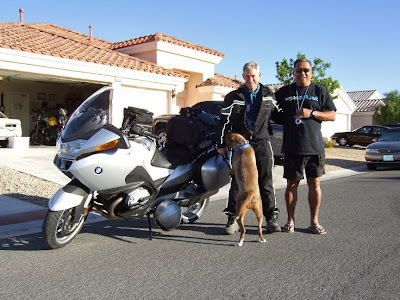 We traveled over 4400 miles and had a great time. As you might imagine, I took a few photos. 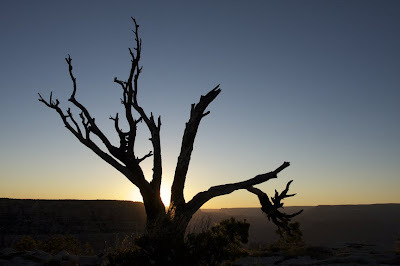 I decided to post a few here, but there were so many great shots and some good stories to go with them that I've decided to create a new blog just for the trip. 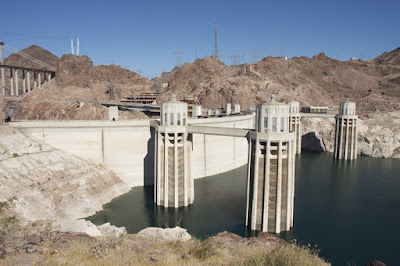 I'll narrate a bit more and show more of the places we visited. 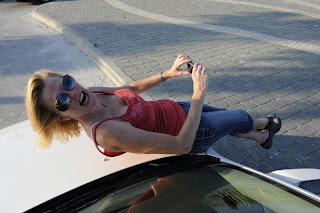 Until then, here is a taste of our adventure. July 3rd - Ocean Beach, CA. Lots of fog, but we had to record our start at the Pacific! 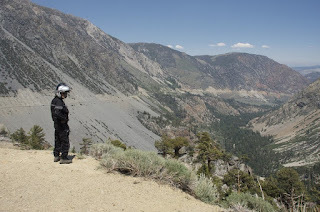 July 4th, Day 1 - Piedmont, CA to Mammoth Lakes, CA. 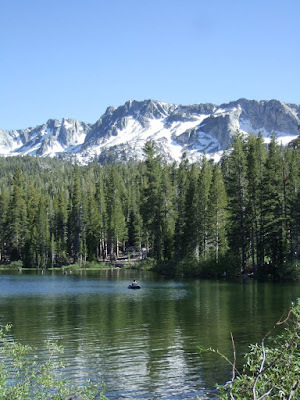 Day one's destination, Mammoth Lakes. 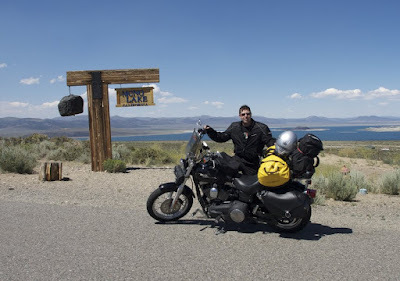 Day 2 - Mammoth to Vegas. Death Valley is just over the ridge to my right. We passed a sign for a town called "Mercury". Day 3 - Las Vegas to Grand Canyon. 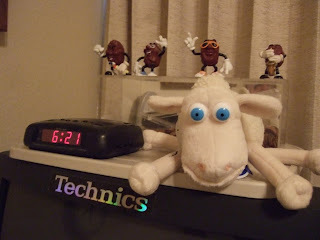 I awoke to raisins and sheep. 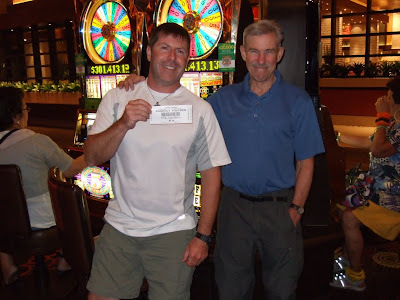 Don with his old Peace Corps buddy Ron who hosted us in Las Vegas. 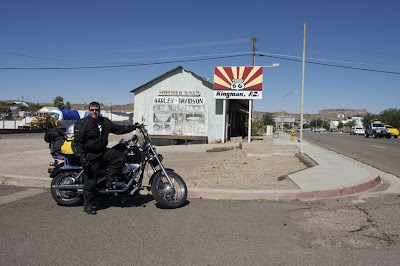 Standing on a corner in Kingman Arizona... OK, not quite Winslow, but as close as we would get! 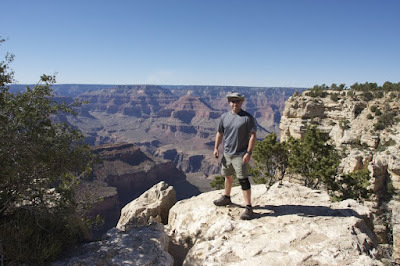 Day three's destination, The Grand Canyon. 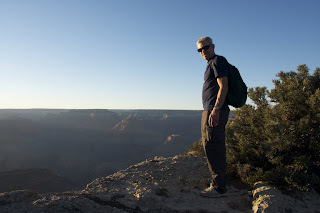 We took a walk on the south rim to watch the sunset. 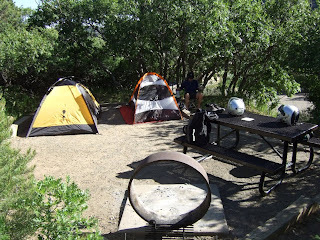 This was home for two nights. 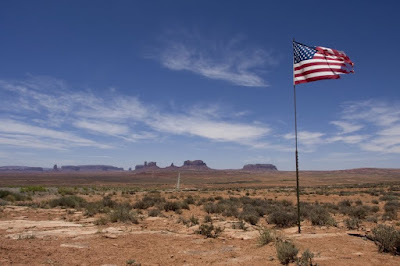 This flag looked so vivid against the blue sky. Don patiently waits as I shoot about 100 photos. 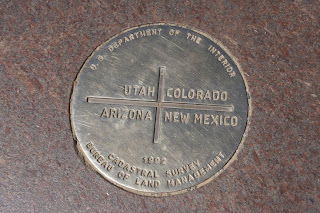 Our route took us by the "Four Corners" monument where Utah, Colorado, New Mexico and Arizona meet. Obligatory tourist photo. 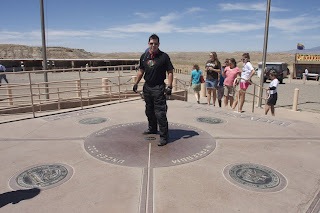 "Look, I'm in 4 states at once!" 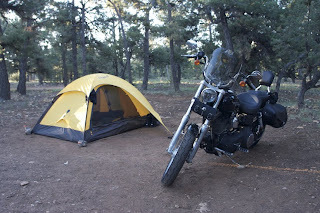 We set up camp in Mesa Verde then took a ride through the park. Finally getting back to a little elevation. 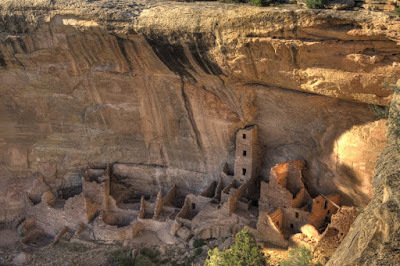 Some cliff dwellings. Looks comfy. 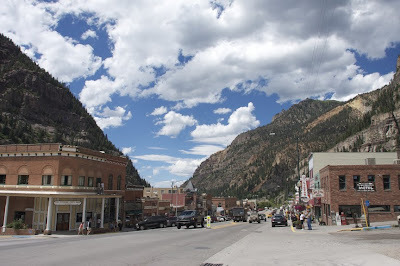 Day 6 was a short ride to Ouray, CO. 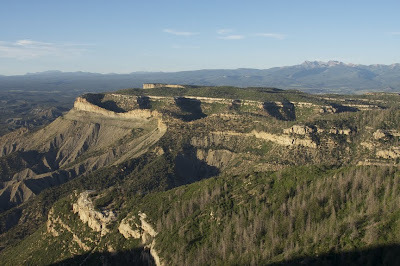 This was the morning view from Mesa Verde. 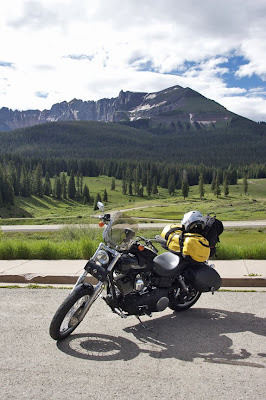 It's hard to concentrate on riding when there is so much beautiful scenery to take in. 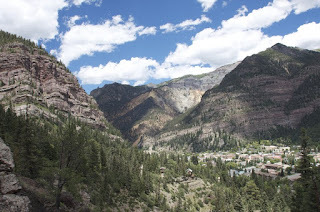 Ouray, CO, nestled in the "Alps of the United States". but my bad knee was just not up to the challenge. Day 7 - Ouray to Raton New Mexico. 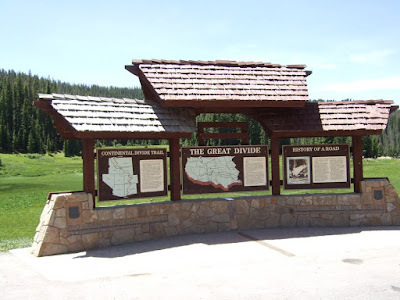 We stopped for a quick photo at the Continental Divide. 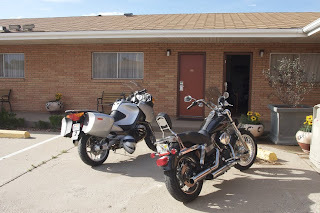 We stopped for the night in Raton, NM. Nothing to see here. 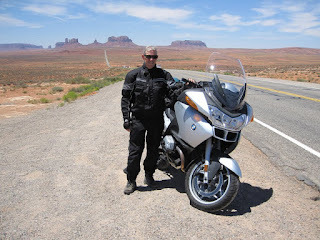 Day 8 - Raton, NM to Sallisaw, OK. Hottest day of the trip with a bank sign in reading 113 degrees in Seiling, Oklahoma. It was also the longest so far at over 500 miles. I didn't take a single picture that day. 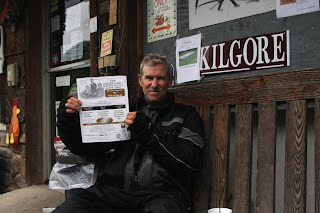 Day 9 - Sallisaw, OK to Jasper, Arkansas. 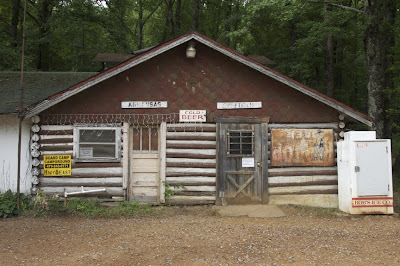 Here is a cool little roadside bar at the AK/OK border. One door for each state! 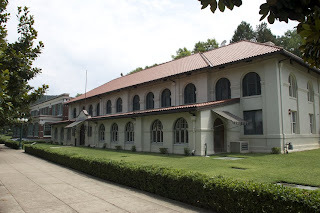 We rode down to Hot Springs and walked around the city. I wish it were COLD water. 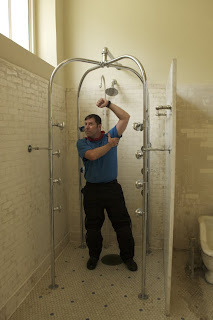 Too hot outside for a hot bath or shower. 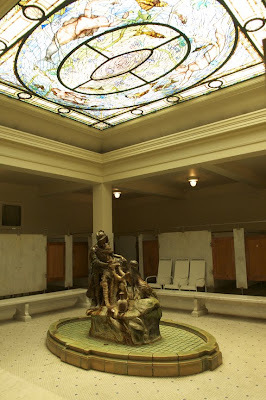 The architecture of these old spas was really something. After lunch, it was time to head north on route 7 and through the Ozark National Forest. 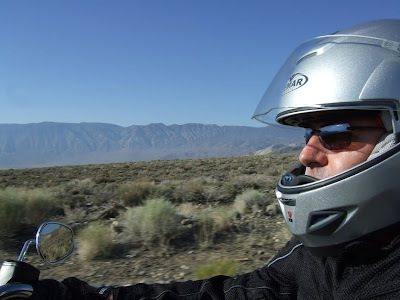 It turned out to be a really nice scenic ride. As the shadows grew longer, we decided to stop in the small town of Jasper. Ever wonder what a $40 hotel room in Arkansas looks like? All kidding aside, the room was great and the people of Jasper were friendly and accommodating. 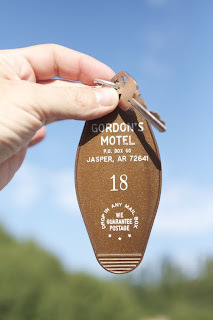 I haven't had a room key like this in years! Day 10 - Jasper to Memphis, TN. 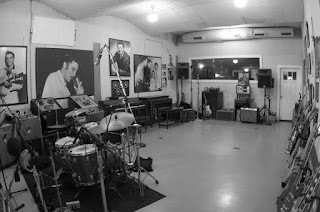 The famous room where artists from Elvis to U2 have recorded. It's still an active studio to this day! 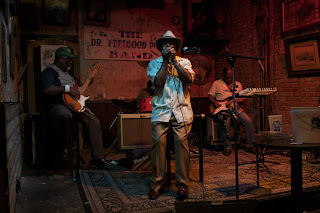 Of course we ended the evening on Beale Street listening to some authentic blues. 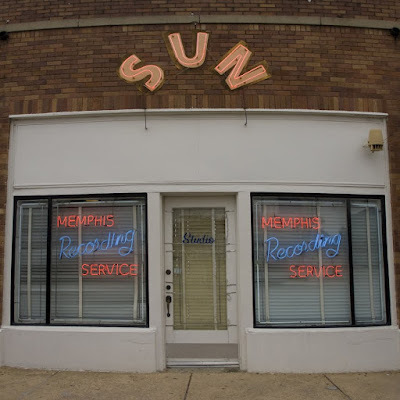 Day 11 - Memphis to Maryville, TN. You never know what you'll find on the back roads. 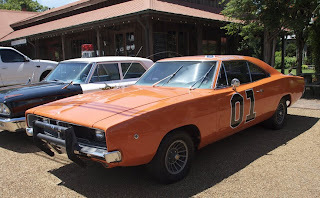 This was a replica of the "General Lee" from the "Dukes of Hazzard" TV show. Sadly, Daisy was nowhere to be found. 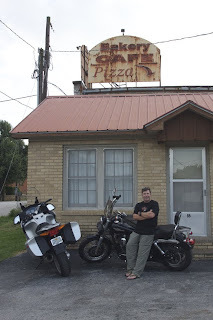 Day 12 - Maryville to Greeneville, TN. 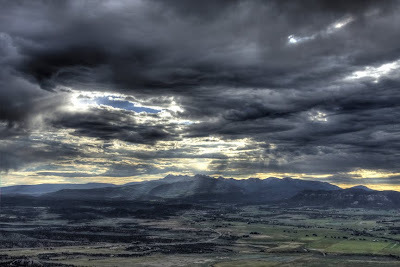 We headed south toward the Smoky Mt. 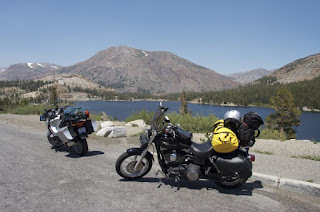 National Park and on the way decided to ride "The Dragon", route 129. 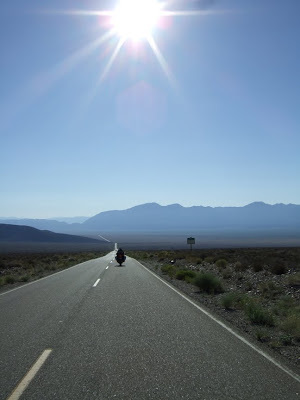 It is a famous and very curvy stretch of road that lures riders from all over the country. 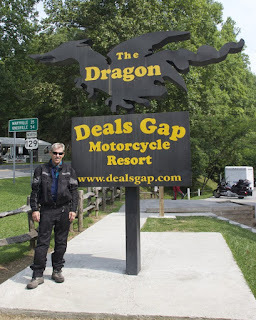 We stopped at Deals Gap for a couple of photos and a cup of coffee. 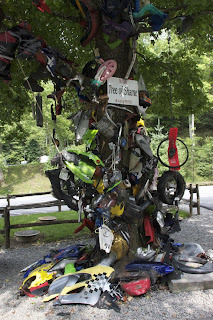 This is the "Tree of Shame" where riders have built a sort of shrine out of motorcycle parts damaged or lost while crashing on the Dragon. I want to know the story behind the Big Wheel up there! 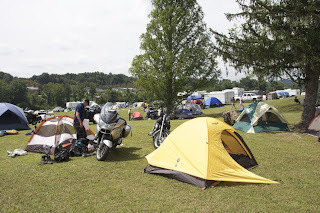 Day 13 - Johnson City, TN and arrival at the BMW MOA Rally. We arrived at the fairgrounds after lunch and waited in line to register. It was pretty crowded, but the line moved along pretty well. 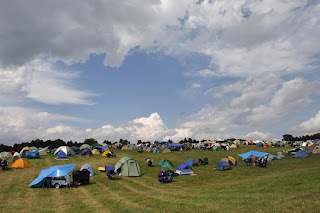 Once we got on site, we rode around looking for a suitable camping space. 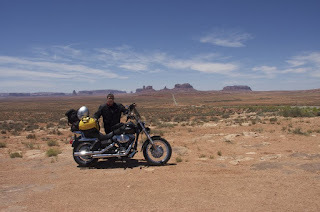 Most of the good high ground was already packed, so we rode toward the edge of the fairgrounds and found a nice spot. Don makes himself at home. Looked like a record crowd showed up this year! The view from my suite. Day 14 - Day trip to Virginia. 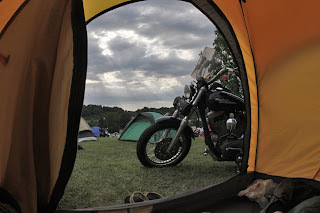 We woke in the morning to a thunderstorm, but it cleared out in time for breakfast and a day ride up to Virginia. 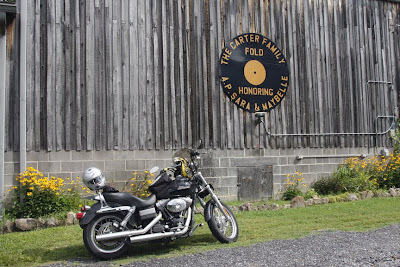 Don wanted to find the "Carter Family Fold". Our GPS units, which had behaved pretty well during the trip, finally lost it... And us. Several times. They tried to take us down narrow dirt roads and kept getting confused. We stopped at a little roadside store for directions and found out we were close. Don sits outside the store with a flyer advertising a show. We found it! Pretty cool place. This is the stage inside. They still have weekly concerts here. 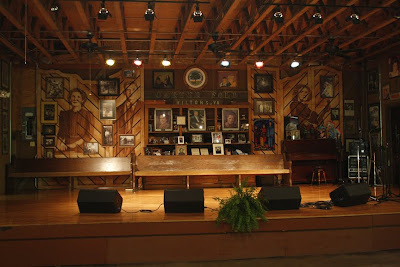 This was also the stage where Johnny Cash performed his last show before his death in 2003. 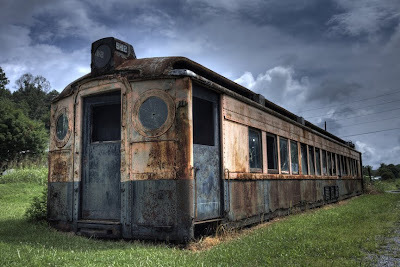 We passed this old train car on the way to the Carter place. I HAD to stop and get some shots. I could have photographed that thing all day! day 15 - Johnson City, TN to Jacksonville, FL. Time for me to head home. Don would stay on the road a few more days and head to Jax on Wed. I rode a little over 500 miles and made it to the house before a big thunderstorm hit. 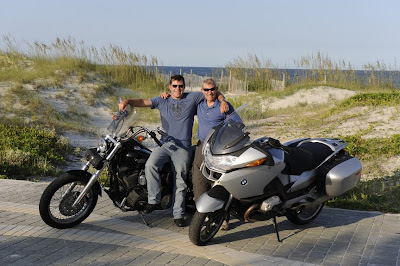 When Don arrived, we hopped on the bikes and rode down Beach Blvd to the Atlantic for the official "End of the journey" photo. Caryn met us down there and took some great shots. Beth grabs a pic with Don's camera. End of the road. We did it! 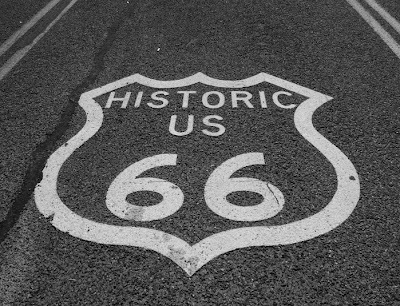 Where do we ride next?